It's been a while since I've gone to yoga. I think about the sangha at my teacher's studio most Thursday nights and Sunday mornings, when I know that she's teaching the classes where I'd like to be, but my yoga practice is less active than I'd like these days; though I work well alone, I am motivated best when I'm part of something larger than myself. Given my summer schedule, I decided to try an early morning class at a studio closer to where I work again, hoping it would inspire me to get back to my practice, even if I couldn't get back to the studio I call home. I admit, my ideas about yoga are heavily influenced by my eight or nine years on and off at YL. I took plenty of yoga classes before then, and I've been to other studios and worked with other teachers, but none of them made me love yoga like my current teacher's studio did. There, they read (and teach) yoga philosophy. They use sanskrit names for asana. There are sadhana classes and kirtan events. But more than anything, when I go to yoga there, I feel like I'm not just stretching my body, but using my body as a vehicle to access the mind. I should have been warned by the class description, which said something about "power" and "panache." Or by the teacher's personal website, which prominently features a slideshow of her--displaying her concave stomach and ribs--in handstands. Or by the studio logo, which is actually a woman in handstand, creating the letter "Y" with her legs in a split. But uncharacteristically, I didn't notice those things. I'd heard from a colleague that the studio was worth visiting, and from another that there was a special deal for new students, so I figured it was worth a try. I arrived early, set out my mat, and gathered the blocks and bolster that I usually take out, to sit and center myself before the class began. No one else seemed to be doing that, though; mostly, people were stretching, bouncing, and generally looking as if they were getting ready for a gymnastics class. The room was stifling, because the teacher had turned on the heater (on the third day of New Jersey summer, and no, it was not advertised as "hot yoga"). We began not with mantra or breathing, as I am used to doing from classes at most other studios I've attended, but in a long-held bridge pose, which morphed into dolphin, which quickly morphed into three legged downward-facing-dog, or raised leg plank. Every few minutes we were directed to "hop" into the air with one foot or another or both, which--it became clear--was all about preparation for handstand. Not long into class, we spent a several minutes against the wall doing half-handstands. And many of my classmates spent a good portion of the class in handstand, taking every suggestion to hop as a recommendation to invert. Several times, when the teacher came to adjust me, I felt like she was pushing me to get into handstand as quickly as possible. Unlike when my regular teacher adjusts me, which almost feels like an extension of my mind gently reminding my body of where it is and where it's trying to be, I felt myself wanting to resist her adjustments, to tell her to leave me alone. By the end of the class I was dripping with sweat, which I guess is a good thing if what I wanted was a workout, but I didn't walk away with any thoughtfulness or insight. There was no feeling of community; there was only, perhaps, a sense of cliquiness. I walked away feeling like I'd been to the kind of gym that makes me hate going to the gym. I'm sure that the studio is the right place for a lot of students. But as I walked back to the office, making a game plan for getting clean using only the sink and hand soap, I thought: my yoga practice, such as it is, is really not about the handstand. It's about anandam. Sure, it's cool to be upside down. And it's great to develop core strength. And handstand has lots of health benefits. If what I really wanted was to perfect my handstand, I'd be doing everything I could to make it happen. As someone who usually tries whatever "more challenging" version of a pose my teacher offers up, I can understand the appeal. I get it: after all, didn't I just write about trying things just to see if you could do them? And maybe there was an element of that for some of the students in the class; I can't know that, because I'm not inside their heads. Yes, preparation for handstand is part of my yoga practice. But for me, there are so many more layers to yoga than that. And spending so much of community class time trying to get into or stay in handstand (which, by the way, is the goal of every class there; I know this because I went a few times, to make sure) left me wondering where the rest of the yoga was. While I understand why being in a community is helpful if you're working on something challenging (we do that to our seniors writing theses), here, it felt like an isolated exercise, without any larger purpose. It was the kind of experience that makes people think that yoga is just about stretching or twisting yourself into a pretzel, that makes them give up. At my regular studio, we end every class with the mantra: "loka samasta sukhino bhavantu," which translates roughly to "may all beings everywhere be happy and free." No one chants: "may I have six pack abs." I'm glad that her students have found a place and an approach that works for them. Maybe I should have been able to get the rest of what I wanted from my inner teacher, as AmarJyothi reminds us each time she ends her classes: "Satgurunath Maharaj ki jai. Jagadambe Mata ki jai." But I need more than handstand from a yoga class, and I think I'll stick with a practice, and communities, that honor purpose and divinity in a way that I can get behind. This summer vegetable pie is full of layers. And it's light enough for the sweatiest of days. Heat oil in a large nonstick skillet, and add the onion and pepper. Saute for about 4 minutes or until vegetables are tender. Add zucchini; cook about 4 minutes more or just until zucchini has just started to brown. Add the spinach, garlic, and 1/4 teaspoon salt; cook for 2 minutes more. In a small bowl combine evaporated milk, eggs, 1/4 teaspoon salt, the black pepper, and nutmeg. Set this mixture aside. Coat a 9-inch pie plate with cooking spray. Unfold phyllo dough. (As you work, cover the remaining phyllo dough with plastic wrap to prevent it from drying out; this can happen quickly, and then you'll have broken phyllo. Which isn't the end of the world, but does make your life more difficult.) Place the first phyllo sheet in your prepared pie plate and lightly coat it with cooking spray, gently pressing into bottom and up sides of pie plate and letting the ends hang over edges of pie plate. Repeat with the remaining phyllo sheets, placing then in a crisscross pattern. 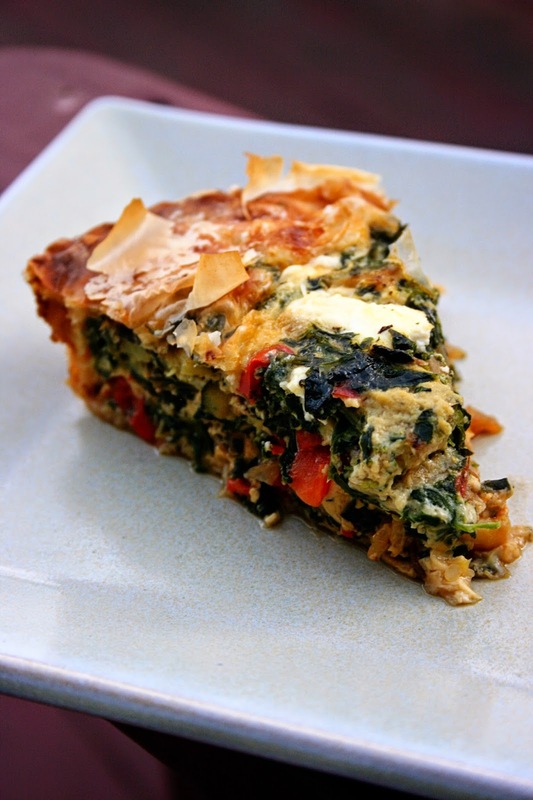 Spoon vegetable mixture evenly over phyllo; sprinkle with cheese. Pour egg mixture over your pie, and fold the overlapping ends of phyllo towards the center of pie plate. Coat the top of the phyllo with cooking spray, and gently press to hold its shape. Bake about 40 minutes or until a knife inserted off center comes out clean. Cool for 15 minutes on a wire rack. Cut into wedges and serve warm. Have you ever done something just to see if you could? I don't remember how it started. A joke, maybe, about my commute? Thoughts of more leisurely mornings for the summer? Whatever it was, it wasn't serious. I do bike, and biking to work doesn't sound like a big deal, but if your commute is 25 miles long and includes some significant hills, and the last time you did 25 miles of hills was in Umbria, in a different decade of your life, it becomes a slightly bigger deal. I'd mentioned the idea to my boss, who is a biker--meaning he thinks nothing of riding 50 or 60 miles at a time; he was amused, and said something along the lines of "well, yeah, if you really want to save the world, that's probably going to make a difference." (Just to clarify here: this has nothing to do with impressing my boss. I'm too old for that.) Somehow, though, the more I thought about it, the more I needed to know: could I do it? What would it be like? I shopped the idea to my kids. My son, the more rational of the two, pointed out that if I got there, I'd have to get home. "We could come pick you up," he offered, generously. "But you'd have to call Daddy. You should probably call Daddy," he added, frowning, now semi-concerned for my welfare. Just this week, I no longer have to drop off my son in the mornings, now that he goes to camp just down the street from where my daughter is in school, so I have a lot more time to myself before I have to be in the office. I spent the weekend waffling, asking myself (and my husband, and my kids) if I might be crazy, checking the forecast, and finally decided to give it a shot. On Sunday night, I slept fitfully, trying to come up with a route that would be less busy and less steep. In the morning, exhausted, I almost bagged it. But after a quick shower, I checked my tires, packed a change of clothes and some soap for washing up in the bathroom at work, kissed the kids goodbye, strapped my pack on my bike rack, and started my morning commute by coasting down my street. It couldn't have been a more perfect morning. The air was cool and slightly damp, and it was almost as if someone had Photoshopped the world through the "vibrant" filter: layers of color--deep blue, and then pale yellow in a field, tall green grass along the edge, punctuated by deep purple thistles the size of my fist, and brown soil, and the black macadam. For the first few miles, I rode in silence. One thing I realized pretty quickly is that I rarely turn off all of my devices for two hours straight, at least when I'm alone. It was refreshing to be listening to and looking at nothing except what was in front of me, to have a long stretch of time to get where I needed to go, and to know that if anything happened, there were about a dozen people I could call. My mind wandered. Has someone made an iPhone mount for bicycles? That could be useful if you were riding around Italy, for example, with only a paper map to tell you where to go to find your hotel for the night. The miles fell behind me. Somewhere in the Sourland mountains, I started to wonder if I'd made a mistake. I pedaled as far as I could up the steepest hill, and then hopped off the bike to walk, imagining what people would think of me, hoping no one I knew was passing me by, and then deciding I didn't care. I'd given myself two and a half hours to get to work, and if I had to walk, I'd get there. And if I could just get up the mountain, then I could fly down it. Which I did. At thirty miles an hour. In case you've never done it: it's a huge adrenaline rush. Suddenly it was like I was back in Bevagna, spiraling down the mountain along the medieval streets, feet off the pedals, jubilant. The road rose and fell several more times before I finally coasted into town, and up to the door of my building, where I let out a whoop of triumph. I let myself in, washed up, changed, and returned to my office, feeling like a superhero. Sure, I still had to get home. But not for another seven hours. At four, I changed back into my mostly-dry clothes, slipped my helmet on, and began the ride home. It was warmer, but still pleasant, and now I knew what to expect, where I'd have to work and where I could let gravity pull me along. I could always call home, and ask them to pick me up, which would be a little less awkward than asking for a ride to work. As I pedaled along, it occurred to me that I'm a lot better at writing when I shake up my routine, or even when I'm somehow more mindful in the middle of the routine. My husband jokes that my writing suffers when I don't go to yoga. It makes sense: you can either live life, or let it live you. Writing, like yoga, or like deciding to do something just to see what you're capable of, is a reflective practice. Life doesn't live writers; writers chew life up and spit it out on paper, or in electrons. Which doesn't mean I'm going to bike to work more often. I just like knowing that I can. One of the reasons I spend so much time sifting through recipes and figuring out what to do with my CSA share is that doing so makes me look at things differently. Traveling--especially traveling off the beaten path--does the same thing. And yep, that's separating coconut milk. Use the full fat kind and it might not be quite so pronounced. Combine half of the green onion, half of the yellow onion, half of the ginger, half the cilantro, half of the garlic, and 4 T. of oil in a shallow bowl. Add the chunks of fish and toss to coat. Cover well and refrigerate for three hours (or, if you're like me and you're in a hurry, toss the fish together with the onion/ginger/garlic mixture directly in your baking pan, and let it marinate for just a little while while you're prepping your broth). If you were patient enough to let your fish marinate, let it come to room temperature just before you begin cooking. Preheat your oven to 350F, and place the fish in a shallow baking pan. You won't need to oil it, because of the marinade. Pour the lemon juice evenly over the fish, season with salt and pepper. Bake 8-12 minutes, depending on how thick your fish is. Heat the remaining 2 T. of oil in a large Dutch oven. Saute the remaining green and yellow onions in the pan along with the bell peppers, stirring occasionally, for about three minutes, or until they begin to soften. Add the remaining garlic and ginger to the pan and saute for about thirty seconds, until just fragrant. Add the broth and heat to boiling, then add the coconut milk and tomato paste. When it begins to boil, immediately lower the heat to and gently simmer. 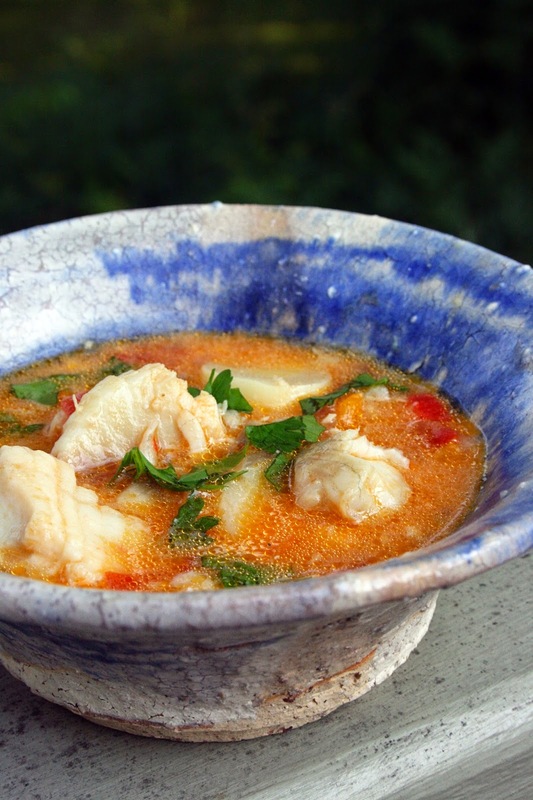 Add the almost-cooked fish and cooking juices to the broth, cover, reduce the heat to low, and simmer until the fish is soft and tender, 5 to 7 minutes. Add the hearts of palm and tomatoes, and cook, stirring occasionally, for 2 minutes. Stir in the fish sauce and black pepper, then serve topped with the remaining fresh cilantro. I keep thinking that perhaps I will have something profound to say, and defer writing until that moment. Of course, we all know that brilliance doesn't happen on demand. And if my colleagues are all off writing books and monographs, the least I can do is see if I still have readers. My daughter, who has long cared a lot about her clothes (despite the fact that her closet is stocked with hand-me-downs), had taken caring to new heights. She refuses to dress in shorts (opting almost exclusively for dresses), is in love with her pink jelly flip-flop-sandals (wants nothing to do with the more sensible sneakers and water shoes), and had a complete meltdown the other morning about wearing a particular mismatched not-skirty-enough bathing suit. That particular scene was accompanied by screams so bloodcurdling we're still shocked that DYFS didn't come knocking that morning. I feel like I spend such an inordinate amount of time trying to talk N. out of attaching importance to her clothes, and that I might as well be tilting at windmills, but what's a parent of an image-conscious young girl to do, when it feels like these are the opportunities for foundational lessons in self-confidence? Why do I need to tell her, in response to her demands for clothing compliments, that she is always beautiful, even when she's naked? Am I unnecessarily overthinking my messaging? That same morning, my son informed me that he needed a pink shirt to wear to before-and-after-care, because all of the classes had been assigned a color of the rainbow for spirit day. I had known vaguely about this, but was wilfully ignoring it because a) he's there for barely three hours during the day, and b) ... pink? I tried to talk him out of it, find a shirt that was multicolored; he was nonplussed. Battling one child over clothing (we literally had to hold her upside down to get a bathing suit on her, and don't even ask me how we applied the sunscreen) left me feeling pummelled, and I caved, assuring him that if we could get out the door early, and if he promised the he would wear it again after today, I would take him to Walmart and look for a pink Tshirt. My mother would have told me to go jump in a lake, I thought. "Pink is my second favorite color," he assured me, confidently. I was surprised by how easy it was to find a pink shirt in the boys' section. He grabbed it triumphantly. At the checkout, I found myself worried that he'd be teased at school, and tried to think of something preemptively constructive to say. I had nothing. In the car, I told him to stick his blue shirt in the bottom of his backback, since we weren't going back hom. I didn't tell him that his friends might tease him (because maybe they wouldn't). Instead, I looked in the rearview mirror. "You look good in pink," I said. Because he does. "Of course," he replied. "Because it's my second favorite color." I have been thinking a lot about gender conventions, given the impending changes to Title IX policy at universities, the recent shooting in Santa Barbara, the federal government's monitoring of the way universities are responding to sexual assault. I think about how much there is to teach my kids about being in the world in a way that is kind and nonjudgmental while also helping them to protect themselves against people who didn't learn those things, and I know that it's going to be a lot harder than trying to get a bathing suit onto a trenchant preschooler. Do you find yourself overthinking these lessons? Or am I the only one? We make this kind of salad on hot days when we're running late, we're mentally tapped out,, and it's too much work to do anything else. The variations are endless: Greek, Italian, Thai, Japanese ... the only rule is that everything has to be small enough so that a representative biteful fits well on your fork. Whisk together ingredients from oil through lime peel in a measuring cup or small bowl. Taste and adjust to fit your preferences. Chop the kale, carrots, peppers, cilantro leaves, and green onions. If you have a Cuisinart, toss the carrots and peppers in there with the "shred" disc, and save yourself some chopping time. 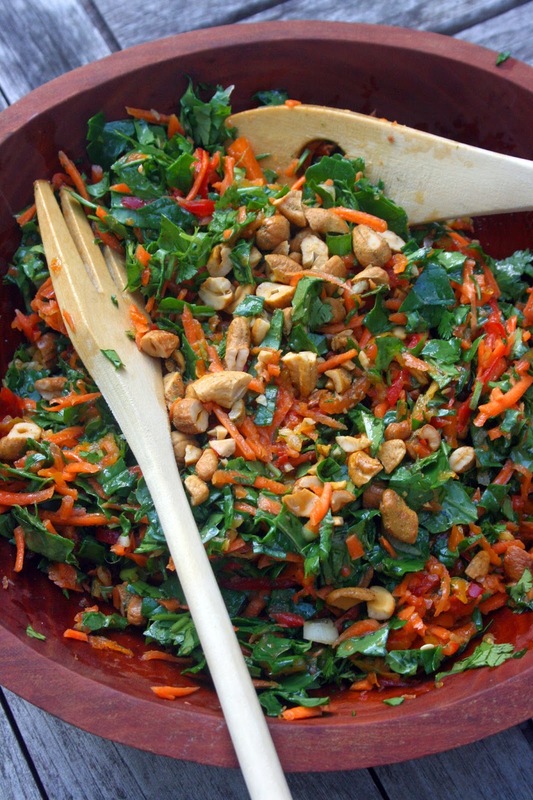 Toss the vegetables with cashews in a large bowl until well combined. Drizzle with the dressing, toss gently a few times, and serve immediately. I don't care what the calendar says; summer started today. After the blur of graduation, the campus has been swept, the parade of vans full of parents moving things has left, and garbage trucks have picked up the debris of chapters closed. I had some extra time before the office opened, so I asked my son if he wanted to walk to daycare, instead of being dropped off. As we set out down the block, he reached out for my hand, like he often does when we're walking together. The air was still just a little cool, but damp, and in the early sun, the day felt completely luxurious, like we had all the time in the world, like we could make the morning move in slow motion. I don't remember what we talked about, but he talked the whole way, wriggling his hand in mine, half-skipping every few steps. I savored it, knowing that he will not hold me, or let me hold him, like this much longer. After I'd kissed him good bye, embarrassing him in public, I headed back to the house to pick up my car, stopping to wave at friends from town on the way to school with their kids, and walking arms outstretched to the gentle breeze and the warm sun. I thought about the start of our CSA, which we squeezed into at the last minute at the urging of a friend who wanted to split a share, and was willing to pick up in September, when my schedule gets busy again. I thought about our vacation plans falling into place, a week in Nova Scotia, miles of road and ocean. I drove to work that morning with the windows and roof open, Coldplay on the radio (which sounded better a decade out from overplay), resisting the urge to get out and dance with wild abandon at the traffic lights. Every once in a while I think back two years, and I am reminded of just how gifted I am, today, right now. 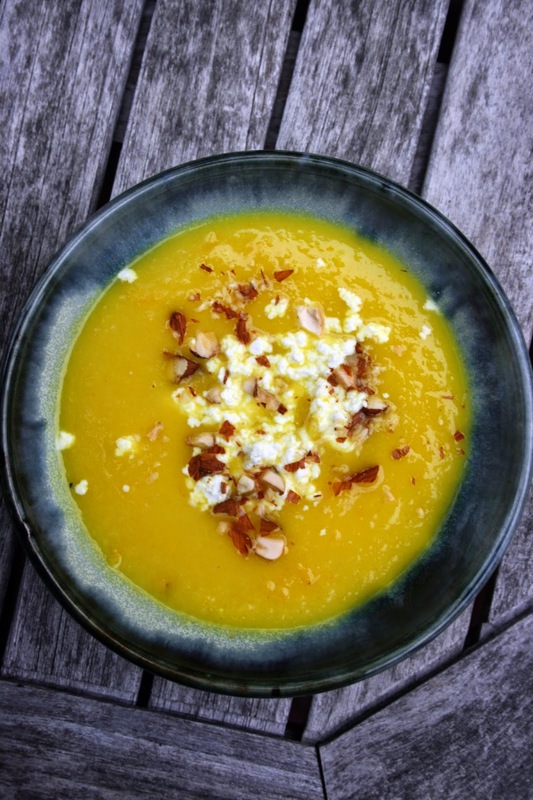 Light, nuanced, and eminently condiment-izable, this soup, adapted from Heidi Swanson's 101 Cookbooks site, is like pouring summer and sunshine into a bowl. She doesn't roast the peppers, but I found the skins to be a distraction from the flavor, and roasting takes away any potential bitterness in a slightly underripe pepper. Preheat oven to 375. Wash your peppers and place them on a lined baking sheet. Roast peppers, turning every 20 minutes or so, until they're evenly browned and blistered. Let them cool 20 minutes or so before you slice them open, and remove the skins, which should slip off easily. Make sure to remove all of the seeds, which should also come off easily. In a mortar and pestle crush several saffron threads with a few pinches of sea salt. Heat 2 tablespoons of extra virgin olive oil in a large pot. Saute onions with garlic and salt until soft, but not brown. Add peppers, turmeric, and the saffron salt and continue to saute for another minute. Add potato and water, and simmer for 20 minutes. When the potatoes are tender, let cool a bit, and puree. Taste and add more salt if needed. To serve, top each bowl with chopped toasted almonds, crumbled feta, and fresh dill.